A remake of the NES classic Balloon Fight with the main character replaced with the balloon-riding Tingle from The Legend of Zelda series. 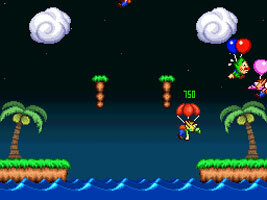 In the main game, clear the Balloon Fighters from the stage with up to four players through local wireless multiplayer. In Balloon Trip you have to dodge sparks for as long as you can. There are save points along the way, allowing you to continue your progress. You can also unlock artwork for the Tingle Gallery by getting good scores in either mode. The game was released exclusively to platinum Club Nintendo members in Japan.